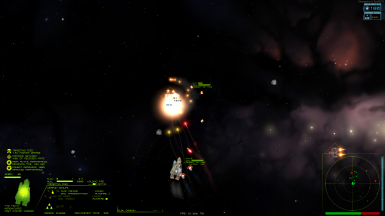 This mod adds a simple, classically-styled radar to the combat interface. LazyLib Required for this mod to function. 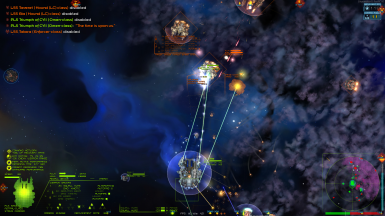 This mod adds a simple radar to the combat user interface. Zoom level is shown as four small white lines perpendicular to the cardinal directions. How close they are to the radar's center depends on the current zoom level. Zoom is controlled with +/-. Ships are drawn as solid-colored shapes. Phased ships will appear faded on the radar, and your ship's current target will have a white marker drawn around it. Missiles are small colored dots; purple for enemy missiles, dark green for allied ones. The brightness of the dot varies based on how much damage that missile deals, so an Atropos torpedo (2,000 damage) is much more noticeable than an Annihilator swarm (200 damage each). Missiles that are locked onto the player ship are colored orange. Missiles that have burnt out are considered enemies as they can hit either side at that point. ship, an orange missile icon will appear here. The brightness of this icon depends on the most threatening missile currently locked on. faster as malfunction risk rises. For ships that don't lose CR this bar will be faded to be less obtrusive. If you are playing in campaign, your ship's maximum CR given the current captain and crew is shown as a horizontal white line. green portion is, the closer to victory you are. Allied ships are shown as a darker portion of each side's bar. A side's portion of the bar will flash if they are in full retreat. The relative fleet strengths at battle start is shown as a vertical white line so you can quickly tell if you're doing better than your opponent.